Happy fall y’all! Well it isn’t techically fall just yet but it certainly is around the Fitzy house. As soon as the kiddos head back to school in August I am ready for all things fall. Today I am partnering with my good friends from No Place Like Home to provide lots of fall inspiration as you begin your fall decorating. We are providing a Fall Tour of Homes. By simply clicking on each link below you can visit everyone’s beautiful home. Now grab a cup of coffee, sit back, and enjoy all this beautiful fall inspiration. One of the things I enjoy most about our new home is the big open stair case right inside the front door. All our prior homes had carpeted stairs so I often dreamed of someday owning a home with a wooden stair case. The stair case in this home did not disappoint. They are so much easier to clean and maintain. No more yucky carpet. And…the best part…decorating for the holidays. There is a landing near the bottom so it was fun to pile on the pumpkins. I still have to pinch myself sometimes when I look around in awe at the home we now have. Even the ease of the move shocked me, this is why having professional movers assist you is really ideal. You may want to try a moving van London if you live in the area. I placed some little white pumpkins from the local market in the window. These mums won’t be blooming for a while. I like to buy them when they are still closed up so I can extend their season a bit. It has taken me several years to learn how to properly care for fall mums. Year after year I killed them. So much trial and error before I finally figured out the tricks to keeping my mums alive all season. You can see my tips to care for fall mums here. 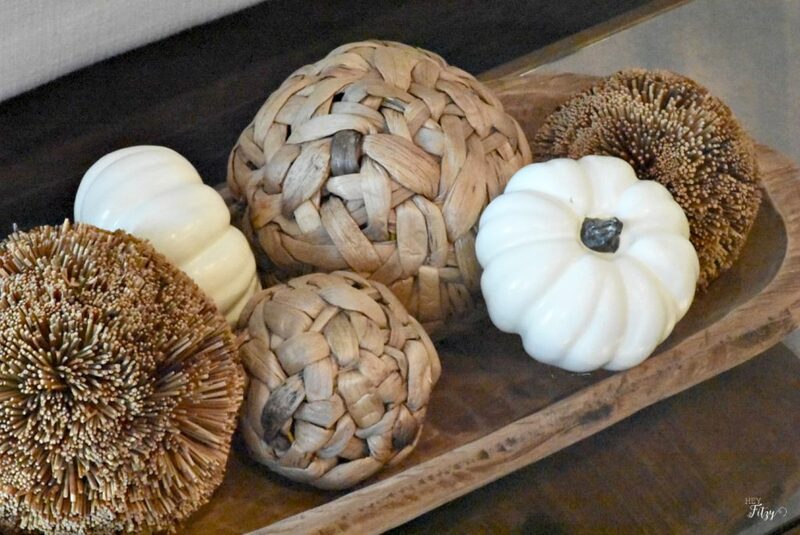 I incorporated several different pumpkins into my fall decor. Some real from the local market and others have been collected over the years. 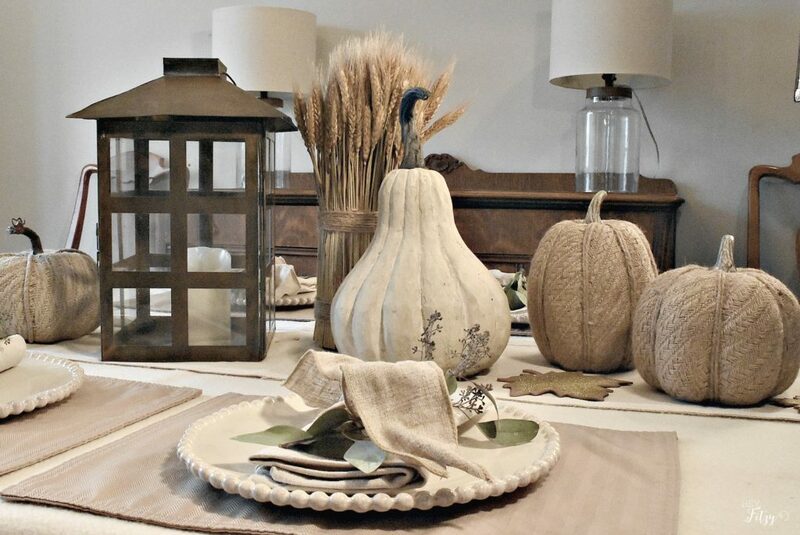 I love my neutral table scape this fall. With some simple clippings from the garden, I used all my existing decor to create a table I adore. It is took me some time to understand that a neutral base is the perfect canvas for added color later. Now I can easily switch up my table with the simple addition of different napkins or garden clippings. This approach helps me enjoy my table for a longer time while keeping it fresh and new at the same time. See more of my neutral table here. Here is my other photo bomber. Miss Ivee just had her 10th birthday. 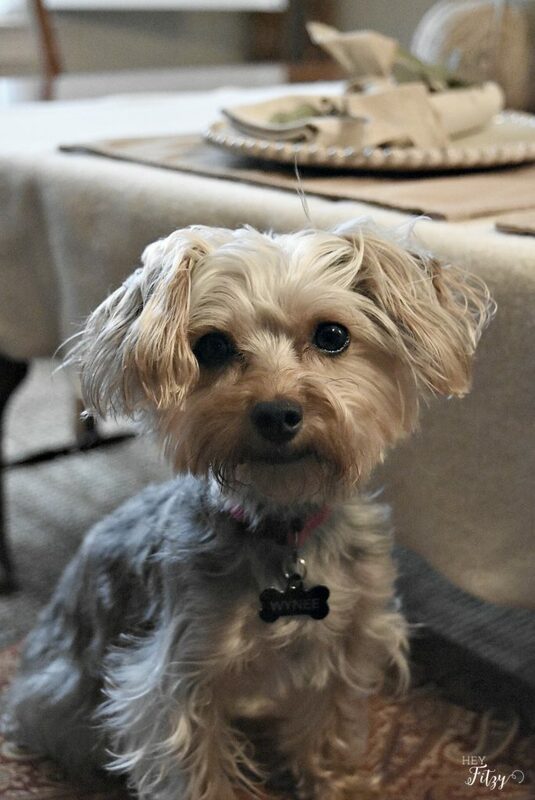 She is the sweetest ol’lady you could ever meet. She has never met a stranger and greets everyone with a wag of her tail. This dough bowl was a fun find at an antique market last spring. I like to change out the decor throughout the year. 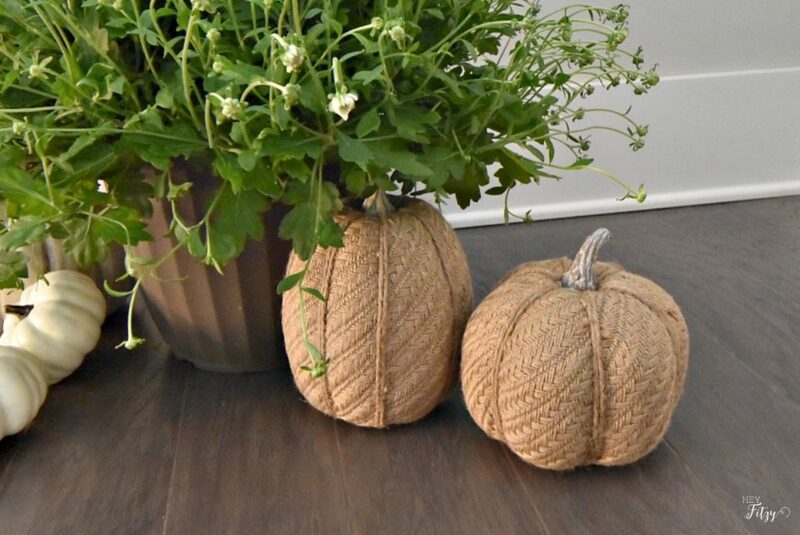 Right now I have a few decor balls along with simple white pumpkins for fall. This mudroom bench is one of my favorite features in our new home. Over Labor Day weekend, my mother-in-law helped me make this great cushion. It was an easy project that really pulled the space together. Thank you for stopping by to see our fall home tour. 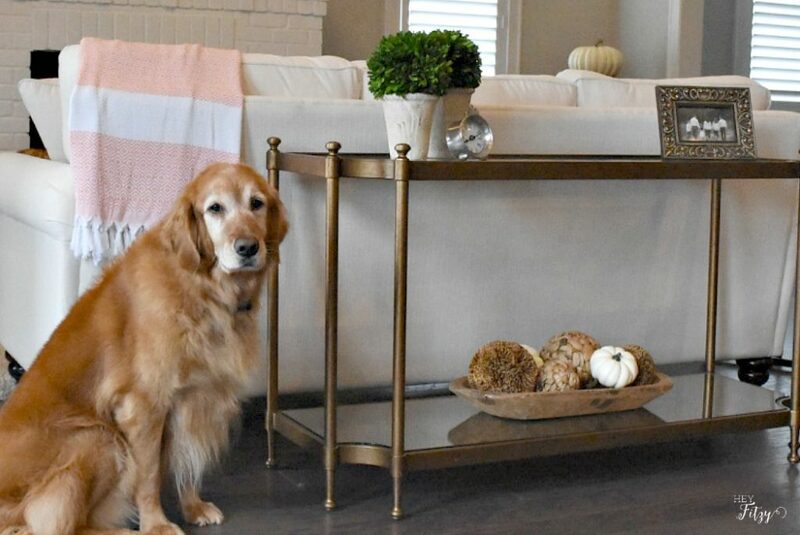 Now take a moment to visit all my No Place Like Home friends to see their fabulous fall decor. Prepare to be inspired! Just click their links below. If you’re trying to improve your house, build your smart home with the latest labour saving technology and see how your lifestyle improves. Tammy, your new home is beautiful and I also would love to have a staircase like yours. 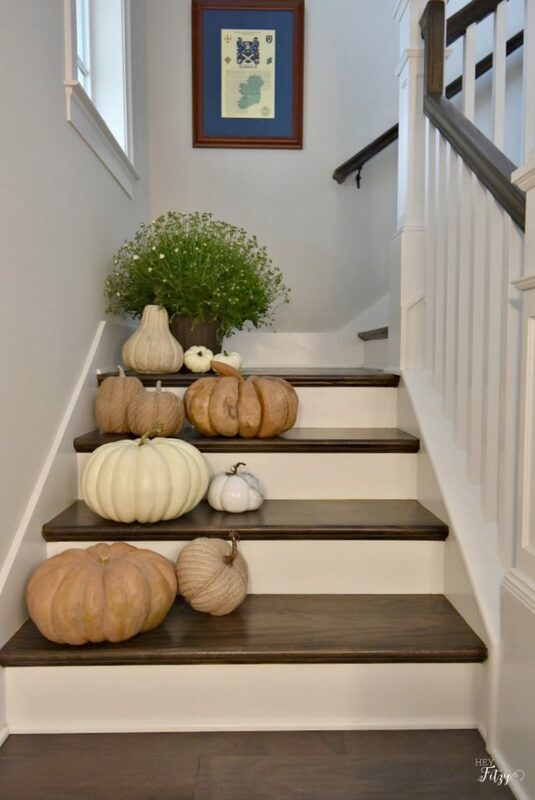 The pumpkins going up the staircase looks perfect. I have already been admiring your fall tablescape this year and it is beautiful! Thank you Sherry! I am really drawn to all things neutral this year. Makes for such easy decor that can easily be switch out or changed with each season! Tammy, your new home is gorgeous, and all your fall accents add such a beautiful touch! And, that bench cushion! I can't believe you made that! Lovely home...now I can't wait to see it decked out for the holidays! Hi Robin, Thank you friend! Trust me...I wouldn't have been able to make that bench cushion without the help of my mother-in-law. She is a pro with the sewing machine. Tammy, you new home look amazing! I want to see every last corner. I love your neutral Fall decor, and your mud room is just so pretty and functional. I always kill my mums too, so I have to go and read your tutorial for how to care for them! I hope it will help me do better with mine. Have a wonderful Autumn darling! Thank you sweet friend! I killed my poor mums year after year...then I finally figured it out. Hope my care guide helps. Wowza, everything looks beautiful. 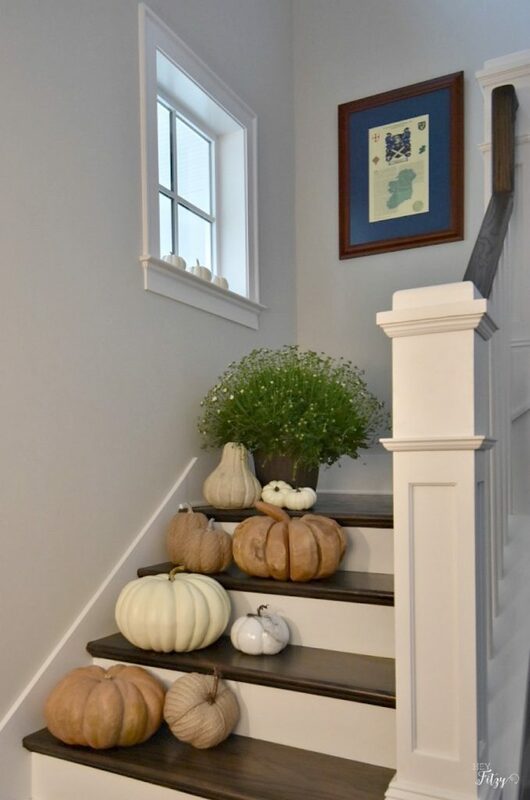 I've always wanted to put pumpkins on our stairway but we have carpet and it's soooooo not the same. Love those fur babies too! Thank you Cindy! I have been dreaming of a wooden stair case for years and was so excited when our new home had one. Really it is all about decorating for the seasons...oh...and I never liked to vacuum the carpet on the stairs. 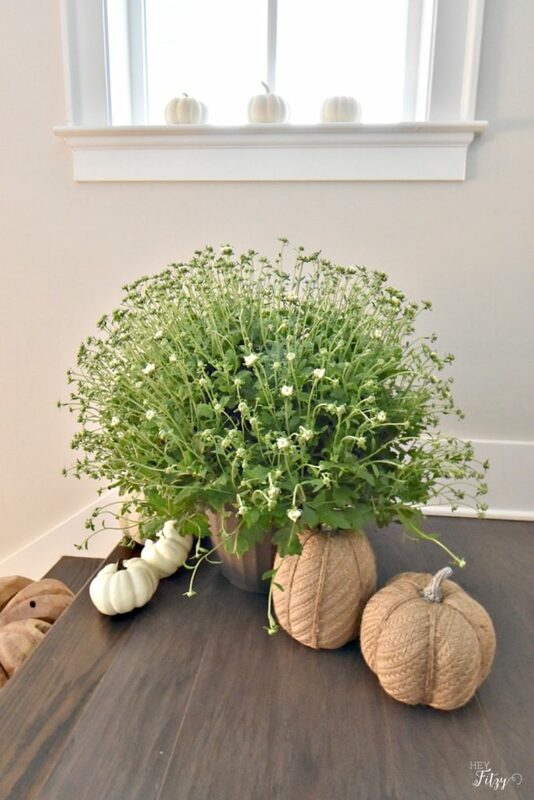 :) Happy fall and hope you found some decor inspiration! Hi Lynn, It has been a lot of fun decorating the new house. Every season is a new challenge (which I love) of redefining a brand new space. Where I put something last year doesn't even apply when in a new space. Several little nooks and crannies to have fun with. Happy fall my friend! Tammy, I'm so glad you included Wynee and Ivee! 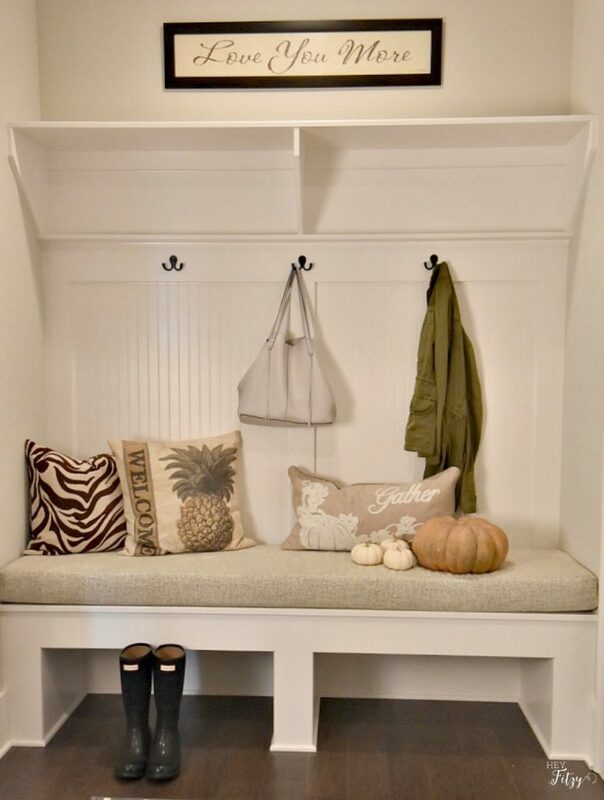 I love how you've decorated your new house for fall and that cushion in your mudroom really pulls things together. I'm going to have to keep my eye out for a dough bowl about the size of yours. Most are just too large. And unlike the others who've commented, I'm lucky to have seen and been in your lovely new house. You've done a great job in decorating it! Hi Carol, Thank you for your kind words. You have indeed been for a visit! And what a fun visit it was! That dough bowl is a fun treasure. Like you, I was finding ones that were either too big or too expensive. This one ended up being perfect. I have so much fun decorating with it. Tammy, everything looks so pretty! I need to peek around some more. When did y'all move in? We've moved into our house on June 24th. It's definitely all a process! 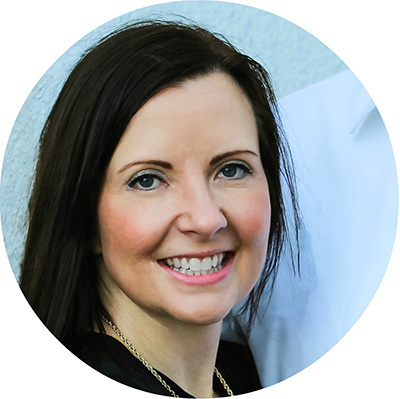 Hi Stacey, We moved about the same time, June 21st. Takes so long to get each room just the way I want it. :) Thankfully I love the process! Hi Linda, Thank you for stopping by. Our staircase is Sherwin Williams- Agreeable Gray. It is a beautiful color that stays a true gray. In our last house I used Sherwin Williams- Accessible Beige and loved it just as much. It pulled closer to a gray in color and was very neutral. Sherwin Williams- Amazing Gray is also a really nice color. Good luck and have fun selecting the perfect paint color. Here is a link to the Sherwin Williams color finder. https://www.sherwin-williams.com/homeowners/color/find-and-explore-colors/paint-colors-by-family/SW7029-agreeable-gray#/7029/?s=coordinatingColors&p=PS0 It is a fun tool to see how different colors will look in a space. I would suggest getting a little sample of the color you like and placing it next to the woodwork in your home. Live with it for a few days to see how the color changes based on the lighting and time of day. Good luck!